Before we went on the Southern Tour, and New Hampshire, and Chicago, I was in Winchester, Virginia. George Washington called Winchester a “vile town” but it’s made vast improvements in 300 years. It’s now a lovely little town in the Shenandoah Valley, just west of the metropolitan DC area. I blogged George Washington’s headquarters (while he was a Virginia militia colonel in charge of building a fort in Winchester) and Stonewall Jackson’s headquarters (while he was commander of the Shenandoah district for the Confederate army) several months ago. So now I’m circling back for a few more posts on our Winchester trip. This first is on the Museum of the Shenandoah Valley. The heart of the museum comes from the collection of Julian Wood Glass Jr., who acquired his money and the Winchester property that would become the site of the museum from his Oklahoma oil baron father. Glass Sr. was a descendent of the founder of Winchester and through that line Glass Jr. inherited Glen Burnie, a 254-acre property with a 1794 house on the outskirts of Winchester. Along with Glen Burnie, Glass had homes in New York and Oklahoma, and all of them were filled with Glass’ art collection. When he died in 1992, his left Glen Burnie to a foundation, with the instruction that the house, with its art, be opened to the public. The house opened in 1997 and the museum, a modern structure built within wandering distance of the house, opened in 2005. The museum houses a little over 1000 objects. Half are 18th and 19th century European and American decorative and fine arts collected by Glass. The rest are more recent museum acquisitions of Shenandoah Valley-related objects. Much of the Shenandoah Valley part was folk art, which was right up my alley. Below is an earthenware sculpture called “The Coopers,” by Isaac Landis (1901-1990). Coopers made barrels and this is a depiction of Shenandoah Valley coopers at work. I was taking a photo of the wooden piece on the right, below (because, you know, George Washington!) when a guard approached and said that if we liked that one, she wanted to show us her favorite piece. It was hidden away from the main public display space, in a back hallway near the elevators. 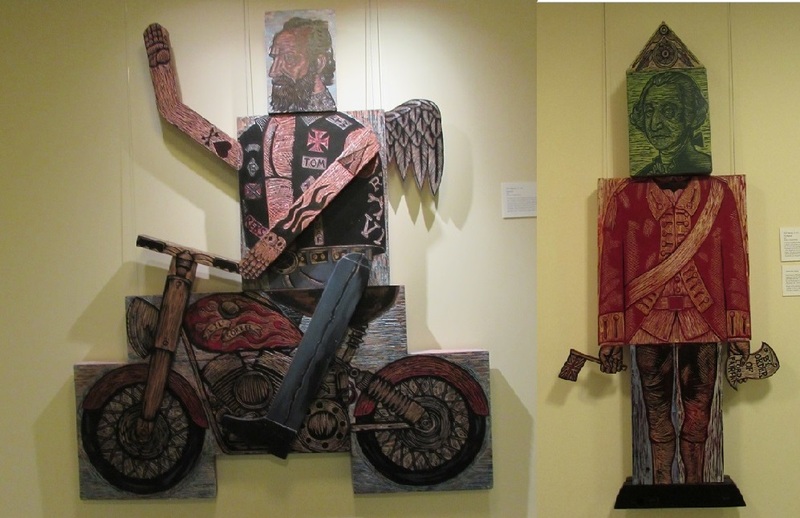 It was Stonewall Jackson reimagined as a biker and it turned out to be my favorite piece in the museum too (sorry, George). The George portrait has the head of the one dollar bill George on the body of George in the British red-coated uniform he wore around Winchester during the French and Indian War. Both are by a contemporary Winchester artist named Neil Stavely. After the museum, we walk about a quarter of a mile down the sidewalk to the house. There was a docent to answer questions, but otherwise we were free to wander on our own. Taylor played an active role in the Glen Burnie restoration and the early years of the museum. Even after Glass and Taylor broke up, after 20 years together, Taylor continued living at Glen Burnie and curating its collection. He also spent time making a miniature replica of Glen Burnie, which is on display at the museum. The portrait over the fireplace in one of the rooms in Taylor’s doll house (below, representing the room in the photo above) is of Taylor himself. He’s dressed, says the label with the display, in a colonial style outfit that he wore to parties at Glen Burnie. And people snicker when I show up at parties dressed a la Marie Antoinette. Glen Burnie has vast formal gardens, also restored by Glass and Taylor. The entire property — house and gardens — can be rented. It’s a popular wedding venue. The museum isn’t all that big and can be done, very thoroughly, in a couple of hours. Only the first floor is open in the house, so that’s about a half-an-hour proposition. The gardens, however, are extensive and depending on how enamored you are of flowers and classic statuary, you could easily spend the rest of the day exploring it. I like that chandelier picture. Is that a trick of the camera or is the ceiling a curious shape? Just a trick of the camera. It was a regular, flat ceiling. Growing up in that area…I have been to Glen Burnie a few times over the years and must say it is one of the most beautiful historic sites I have had the pleasure to visit. I highly recommend it to anyone interested in history, antiques and especially gardens. I am glad to hear that things have “evolved” back home, as several years ago…Taylor was said to have been the hired Gardner/Designer. There was never any talk of the true relationship between Taylor and Glass. Thank you for bringing this to the forefront in your article. I otherwise would not have known any different…. Funny and sad that they called Taylor the gardener at one time. It really struck me that now they just came out and said “Glass is gay and Taylor was his partner.” Because I’ve been to enough museum and other public sites where clearly they’re hiding parts of the story to know that many tend avoid anything that they think mucks up their narrative. Nice that the Museum of the Shenandoah Valley doesn’t treat the relationship as anything out of the usual. Agree that the house and museum are particular stand-outs and definitely worth regular visits. What a gorgeous estate! I love miniatures, I find them fascinating, and have to love anyone who can create such a perfect miniature of their estate. The gardens look amazing, so this place seems to have everything. You would love the miniature house. The time it must have taken him to do it …. We’ll try to get you there someday.